All season long, we've looked at five matchups to watch between the Philadelphia Eagles and their next opponent. In the playoffs, we'll look at five matchups on each side of the ball. Let's start with when the Atlanta Falcons have it. The Eagles' basic game plan defensively is the same every week. They want to shut down their opponents' run game, make them one-dimensional, and then get after the quarterback. That's not very complicated, nor is it easy. When the Eagles have been able to do that, they have dominated opposing offenses. If you merged Freeman and Coleman into some sort of superback, the Falcons would have themselves an MVP candidate, according to Jim Schwartz. "Their running backs, if you combine the running back stats, you're talking about a first-team All-Pro – 1,500 yards, I think 12 touchdowns," said Schwartz. "So we have to look at it that way. There's going to be a lot of challenges this week." If you combined both players, they'd have 2109 yards from scrimmage and 16 total TDs. So they'd basically be Todd Gurley. OK, that may be a stretch, but there's little question that the Falcons get a whole lot of production from their backs. It's not just Matt Ryan to Julio Jones all day. The Eagles' primary goal, first and foremost, should be to stop the run. If you happened to catch the Falcons' win over the Los Angeles Rams in the wild-card round, you undoubtedly noticed Rams DT Aaron Donald wrecking shop against the interior of the Falcons' offensive line. That was partly because (A) Donald is a beast, but also (B) the Falcons had to place OG Andy Levitre on injured reserve the week of the game with a triceps injury. The Falcons' guards, LG Ben Garland and RG Wes Schweitzer, are the weak link of the Atlanta offense. Conversely, the Eagles' defensive tackles are a significant strength. Timmy Jernigan was quiet down the stretch, but he should be well rested after being inactive Week 17 against the Cowboys. It is imperative that he and Fletcher Cox take advantage of this matchup and push the pocket back into Matt Ryan's face. It might also make sense to utilize Brandon Graham's quickness on the inside on obvious passing downs. Well, once again, with Carson Wentz out, the defensive line is the strength of the team, and they are going to have to get after opposing quarterbacks in order to win in the playoffs. Defensive lines have carried teams to championships in recent history. The Giants’ two unexpected Super Bowl runs were both fueled by their defensive lines, as was the Broncos’ of a couple years ago (with a hat tip to their secondary shutting it down on the back end as well). The Falcons' offensive tackles, Jake Matthews and Ryan Schraeder, are good starters, though certainly not All-Pro level. This is another matchup that the Eagles must win with their deep and talented defensive ends on the outside. "You can have the great pass rush outside, but if the quarterback can step up, you are not going to get him," said Schwartz. "You can have great inside pass rush; if you don't have any edge pressure, he can escape outside. It's a four-man group when it comes to four-man rush; it's a five- or six-man group when it comes to blitz. Every man needs to do his job for it to be effective." On the season, on average, Matt Ryan got the ball out in 2.72 seconds, according to the NFL's Next Gen stats. That was the same amount of time on average as Carson Wentz. In other words, the Eagles aren't facing an offense like the Giants', where they try to protect their offensive line by getting the ball out in two seconds or less. The Eagles will get pass rush opportunities. No matter who they play the rest of the way, the Eagles are going to be at a major disadvantage at the quarterback position. The equalizer can be if they dominate in the trenches. Oh, hey, yeah, by the way, we should probably mention Julio Jones at some point here, right? He's kind of a good player. On the season, Jones was second in the NFL with 1444 receiving yards, though he only scored 3 TDs. In the Eagles' win over the Falcons a year ago, Jones had 10 catches for 135 yards, and it was largely viewed as a big win for the Eagles' defense to have 'held him' to that. It could have also been more had Jones not had a bad drop late in the game that put a big nail in the coffin in that game. "The point is to try to win the game," he said. "I think that we have to keep our eye on that. If Julio Jones has 350 yards receiving and we win the game, that's what it took to win the game. If he has 10 yards receiving for the game-winning touchdown, then that wasn't enough. "So I think you have to look at it that way and say, how do you stop their offense, how do you minimize their scoring, and not just concentrate on one player, because like I said before, they do have other players that are threats. [Mohamed] Sanu has been a consistently good player for a long period of time. Their tight ends really developed. Both backs can catch the ball out of the backfield. Pro Bowl quarterback. It’s not just a one-man team." Yeah, that's a nice 'coach-speak' answer, but the reality is that Jones is one of the best players in football, and you better have a plan to stop him. Last year, with a very banged-up Eagles secondary, Jalen Mills followed him all over the field. With a healthy secondary heading into this matchup, I don't suppose that will be the approach once again. In recent weeks the Eagles have really struggled with double moves. Jalen Mills, Ronald Darby, and Sidney Jones were all beaten on slant-and-go routes in the last three games of the season. So the Eagles' corners should stop trying to jump routes then, right? Eh, Schwartz warned about the dangers of being too passive as a corner as well. "You can go overboard either way," he said in response to a question about the Eagles' corners being too aggressive. "You can play too conservative and look terrible. You can play too aggressive and look terrible." Does Julio Jones know how to run the slant 'n go? 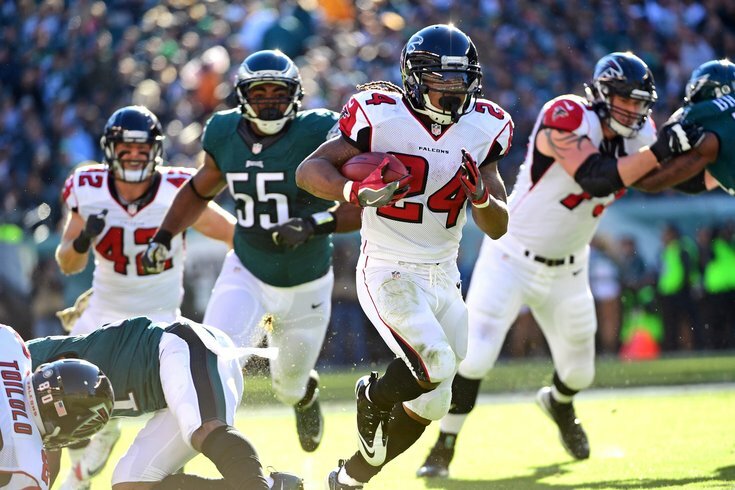 The Falcons were second in the NFL in third-down percentage, converting on 43.9 percent of their third-down attempts. A big reason for that, in addition to their talented running backs, were the Falcons' 'other' weapons in the passing game, WR Mohamed Sanu and TE Austin Hooper. The Falcons like to stay on schedule, and not play too far behind the sticks on third down. When they throw to Sanu and Hooper, they complete those pass attempts with a very high frequency. In 2017, Hooper made a reception on 49 of his 65 targets, or 75.4 percent. That was good for fourth in the NFL. Sanu made a reception on 67 of his 96 targets, or 69.8 percent. That was good for 18th in the NFL. That is outstanding efficiency from your second and third options in the passing game. If those receptions are on third down, that's an obvious way of keeping the chains moving. If Sanu and Hooper are making shorter receptions on first and second down, that keeps the Falcons on schedule, and in a better position to convert on third down. Either way, Sanu and Hooper are a big part of the Falcons' success on offense in terms of possessing the football. "We're a pretty good third-down team," said Schwartz. "Some of that will have to do with being third-and-long. When it's third down and three, it opens up an awful lot of their offense. "So it does benefit us to have teams third-and-long. I think you've seen that a few times this year. When we put teams behind the chains, we can make it tough for them. We're a good pass rush team. We're a good tackling team. When we do those things, it's going to be hard to convert third-and-long." This is a crucial game for the Eagles' linebackers. In addition to trying to stop the duo of Freeman and Coleman on the ground, they'll have to deal with them, along with Hooper and Sanu, in the short-to-intermediate parts of the field in the passing game. Nigel Bradham, Mychal Kendricks, and Dannell Ellerbe will have their hands full this Saturday.